A very unusual and fascinating movie that is flawless in the first half, but veers far off track in its second half. The Lobster is probably the biggest example of a movie that has two extremely different halves, as is out there. These halves are so different, in fact, that one of them is terrific, and the other one is completely lousy. The movie seems to be about a hotel, where you check yourself in for a month, and try to find a mate. If you don’t find a mate during your stay there, they turn you into an animal. What a crazy and cool premise. And it’s handled flawlessly, in a black comedy, somewhat serious way. But then the second half of the movie has the characters leave the hotel, join a band of rebels out in the woods, and change everything that was working for this story, including the comedic tone. What a shame, considering this movie was absolutely excellent in it’s first half, and headed toward being the best movie of the year. If only it could have kept that up, just doing more of the same thing it already had going for it. 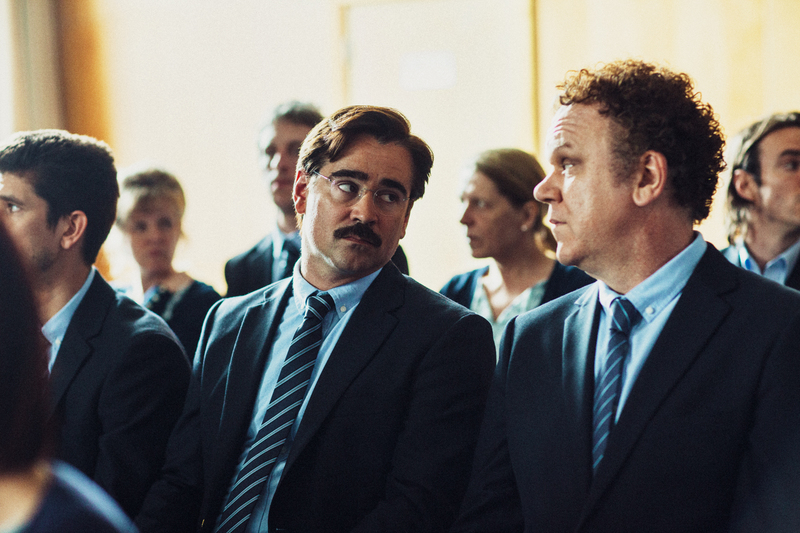 The Lobster is a movie that takes strange and creative to a whole other level. At least in its first half. The movie has a bizarre plot about people who get turned into animals, and yet somehow it manages to feel more black comedy / tragic drama than it does sci-fi. And that is actually pretty cool. It takes itself seriously, while at the same time poking fun at how ridiculous a world would be where such situations really existed. The Lobster does this by focusing much more on the characters who live in this crazy world, than it does on the crazy world itself. The movie opens with Farrell’s character, David, sitting down for an interview, with a dog laying on the floor by his feet. David tells the woman conducting the interview that the dog is his brother. She asks him if he understands the rules and in doing so, explains them again for the audience. Something like, “you understand that if you don’t find a suitable mate in exactly seventeen days, you will be turned into an animal of your choice.” She then goes on to explain how he will have a second chance to find a mate as an animal, but certain animals are good fits for being mates with other animals, whereas other ones aren’t. This woman even gives examples of animals that are good paintings for each other. In these ways, the film gets is to start thinking about its topic seriously, moving past the strange idea of turning people into animals, and instead giving us new questions and ideas to ponder. It’s a smart technique. This movie clearly has a ridiculous premise, but what’s so brilliant about it is that this story takes the ideas and treats them with a serious tone. This actually breaths realism and believability into the plot. And the movie carefully avoids any potential land mine of an opportunity to go off the tracks. So, for example, we never meet a person in human form and then later on in animal form. And we certainly never witness the transformation, or even hear anything about the process. Instead, this is a film about the people who are in this situation, stuck at a sort of hotel. The hotel is actually a facility for single people. If you become single, then you need to check yourself in. If you don’t, then they go out and hunt you. Once checked in, however, your opportunities and freedoms become very limited. You have a set wardrobe with no options of what to wear, and you have to spend your first day and night without the use of one hand, as it is handcuffed behind your back. David meets some other guests at the hotel and starts hearing some stories. He attends lectures and dances, hoping to meet someone. At one lecture, a man tells a story of how his mom got turned into a wolf and out in a zoo. He went to visit one day snd climbed into the cage, where he was attached by the wolves. Only two wolves didn’t attack him. He suspects that one of these was his mother. David makes friends with some of the characters he meets, including a man who is especially awkard, played by John C Reilley. At breakfast everybody sits alone at his or her own table, all facing the same way, looking out the window. And at nighttime the characters go straight from a formal dance to a hint out in the woods. They are hunting people. If they catch any, they get extra days added on as guests of the hotel before they get taken and turned. Considering this situation, where if you don’t find someone you are forced to become an animal, combined with the fact that all of the guests at the hotel are single, you would think that most people there would be desperate and coupling up with anyone they can find. The hotel has ways of dealing with this. Once two people have agreed to become a couple, the hotel puts them through activities and adventures together, watching them closely to make sure the pairing is not a sham. It would have been more interesting to see some off this than to watch the movie, in where it actually goes in the second half. The closest we get is to see David couple up with a sadistic woman who kills his dog brother just to test David and see if he is really sadistic too. He pretends he is, and goes along with it, simply because he doesn’t want to be turned into an animal after the time in the hotel is over. All of this is fine, (although, are we really to believe there are no sane women he can be coupling up with.) But then, it would have been nice to see the hotel spying on him while he took trips with this woman on yachts, (something we hear about from another couple.) Instead, we get a second half, that is all about the rebellion out in the woods, and miles away from the excellence that made up the first half. In the first half of the movie, we were given the luxury of feeling like we were a guest at the hotel with a whole strange set of rules, leading up to the possible animal transformation. The movie felt like a Charlie Kaufman – Spike Jonze film (Being John Malkovich, Adaptation.) Those movies strived on being beyond creative to the point of pushing the imagination into strangeness in a dark and uncomfortable, yet always funny kind of way. And then suddenly the movie decided to change locations for the second half, and in doing so, also changed the tone. That was the mistake. It became so much darker that it stopped being funny at all, and lost all sense of what was making it great. If there was ever a movie that really changed gears and lost its momentum between the first half and the second half, than this is it. Sure, other movies have changed tones and genres in between halves, (like From Dusk Till Dawn,) but this one went from being an amazing movie (possibly the best of the year,) to just being a mess and losing all sense of what was making it good. The hotel, and all of its rules, and even the guests there, were terrific. So what does the movie do? Have the character leave the hotel, leave those guests, and basically leave the storyline behind. Not a smart move. And it’s a real shame, because all this movie needed to do was keep going along the same path it was already on. It really did feel like one of the better Colin Farrell black comedies, (In Bruges, Seven Psychopaths,) and might have even been better than those movies, if it hadn’t lost it’s way, and dropped everything that was making it work.